I explained Living Card Games in some depth in the Lord of the Rings LCG Review but I will go over the basics here as well. Living Card Games from Fantasy Flight Games are a (relatively) new style of card game that draws heavily from Collectible Card Games (CCGs) in many ways. The main difference between an LCG and a CCG is that when you buy a pack of LCG cards you know exactly what you are getting. You are purchasing a full set of cards. Otherwise LCGs still rely heavily on deck building and other familiar mechanics for any CCG players. The best part about this is it means you will spend far less on an LCG and will be able to have all of the cards without any luck involved. As I mentioned, Warhammer: Invasion is a competitive card game pitting 2 players against each other, much like many of the CCGs such as Magic: The Gathering. 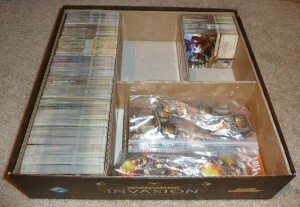 In the case of Warhammer: Invasion each player has a capital board in addition to his deck of cards. The goal of the game is to burn 2 of your opponent’s capital zones before they can burn yours. Turns consist of four stages (3 of which correspond to a zone on the player’s capital board): Kingdom, Quest, Capital, Battlefield phases. The Kingdom is used to increase the number of resources a player obtains each turn. The Quest zone is used to increase the number of cards a player draws each turn. The Battlefield is, as expected, where units are placed to be able to attack the enemy. The Capital phase is the phase in which the player is allowed to play new cards from his hand. Players are able to play units and support cards into any of their three capital zones. The unit or support cards increase the benefits gained from the zone by the amount of power (hammers) on the card. There is a lot of balancing to be done with the three zones to ensure the player has enough resources to play more cards, can draw enough cards, and can attack enemy zones successfully. In addition players need to make sure to simply have enough units in a zone to be able to defend that zone from attackers. 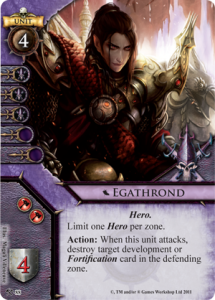 One of the interesting things about Warhammer: Invasion coming from other card games is that you do not generally exhaust (or “tap”) cards in order to use them for things such as attacking or defending. Instead certain cards allow a player to exhaust or tap a card (called “corrupting”). Players are only able to normally uncorrupt a single card on their turn. This idea was something that actually took me a little bit of time to get used to coming from other card games, but once I was used to it I found it to be a nice change of pace from the typical “tap to perform any actions” play style. The other mechanic that differs a bit from other games is the combat mechanic. During the Battlefield phase of his turn a player may choose units from his battlefield to attack any of his opponent’s zones. The defending player may choose any number of units in that zone to defend with. Instead of assigning individual attackers to a specific defender, the attack occurs as one large group versus another. Once the attackers and defenders are declared the players assign their damage to the enemy units of their choosing. This method of combat gave me more of a “big battle” feel than the typical one on one combat of most card games, which made a lot of sense for a Warhammer game. 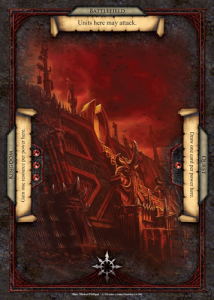 Those of you familiar with the Warhammer universe will be right at home with most of the cards and the races. The core set comes with 4 races (Dwarves, Empire, Chaos, and Orcs) and 2 more races are added through the Assault on Ulthuan expansion (Dark Elves and High Elves). Other races make appearances as neutral cards, including Lizardmen, Skaven, Wood Elves, and Vampire Counts. Each race has an area that it really excels at. For example, Chaos includes a lot of ways to corrupt your opponent’s units, Orcs have hordes of units with lots of damage, High Elves are great for dealing indirect damage to your opponent without attacking. My one major complaint about the game is that sometimes the races feel a little bit too specialized, making it hard to break free from a specific play style. At this point Warhammer: Invasion has been out for a few years and has amassed quite a large collection of expansions. At the time of this writing there are 3 deluxe expansions and 20 smaller battle packs. As mention above, though, this does not get nearly as expensive as you might think. I was able to pick up everything but the latest 2 or 3 battle packs for under $200. This gave me a very large collection of cards to use, and unlike my time spent with Magic: The Gathering I do not have 500 land cards that are worthless. Whether you are new to competitive card games or an experienced CCG player the game is very fun. The rules at their core are very simple to pick up (though you will most certainly end up with many situations in which you need to refer to a FAQ for something that pops up), but there is plenty of room for strategy. 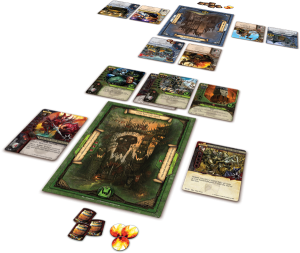 If you would like to find out more we have put up a Living Card Game Resources page for players of both Warhammer: Invasion and The Lord of the Rings: The Card Game. This page contains many valuable downloads and links to reference sheets, deck builders, and various other goodies. You can find links to the official rules and FAQs as well as full video tutorials from Fantasy Flight Games on this page as well. This entry was posted	on Wednesday, November 2nd, 2011 at 5:51 pm	and is filed under Reviews. You can follow any responses to this entry through the RSS 2.0 feed. You can leave a response, or trackback from your own site.